Opened in 1989 Fajitas & 'Ritas is an easy going, fun restaurant and bar which features fresh, healthy Tex-Mex and barbecue cuisine. 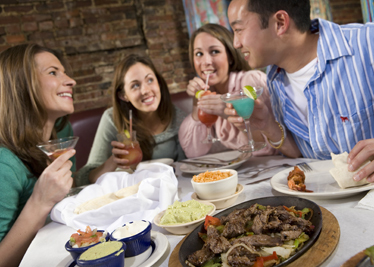 Its namesake specialties include a variety of sizzling fajitas and frosty margaritas. The award winning location stresses generous portions, "cheap eats" prices, prompt, friendly service and open, casual space. With its colorful wall murals and casual atmosphere, Fajitas & 'Ritas is the perfect fun and festive place to throw your next party. "The place is friendly, the food is fun and abundant." A Phantom Gourmet Great Ate!